Adam Allard (West Sioux) 47-1, Fr. over Cobe Siebrecht (Lisbon) 48-7, So. (Dec 5-2). Jaymus Wilson (Alburnett) 49-5, So. over Daniel Kimball (Don Bosco) 34-7, So. (Dec 4-3). Caiden Jones (Lake Mills) 50-4, So. over Daniel Meeker (Wapello) 40-9, Fr. (TB-1 7-5). Bryce Kafton (Maple Valley-Anthon-Oto) 42-4, So. over Connor Attkisson (Tri-Center) 34-6, Fr. (Fall 1:14). Cael Happel (Lisbon) 53-3, Fr. over Devon Meeker (Wapello) 39-8, Sr. (TF-1.5 4:11 (21-6)). Jacob Ragsdale (Dike-New Hartford) 29-4, Sr. over Logan James (Underwood) 38-6, Fr. (Dec 10-8). Nathan Phillips (Interstate 35) 36-11, Sr. over Kurtis Krager (OA-BCIG) 38-6, Jr. (Dec 10-3). Easton Larson (Don Bosco) 33-10, Fr. over Tyler Helgeson (Lake Mills) 45-12, Fr. (Dec 6-0). Brock Henderson (North Linn) 48-2, Sr. over Brady Kyner (Southeast Warren/Melcher Dallas) 52-1, Sr. (Dec 3-0). Gable Fox (Don Bosco) 32-2, Jr. over Will Portis (Rockford) 49-5, Sr. (Fall 3:10). Blake Thomsen (Underwood) 45-12, Fr. over Ryne Mohrfeld (Lisbon) 42-19, So. (Dec 12-7). Tatem Bluml (Riverside, Oakland) 50-8, Sr. over Dylan Loomer (Jesup) 38-12, Sr. (Dec 8-1). 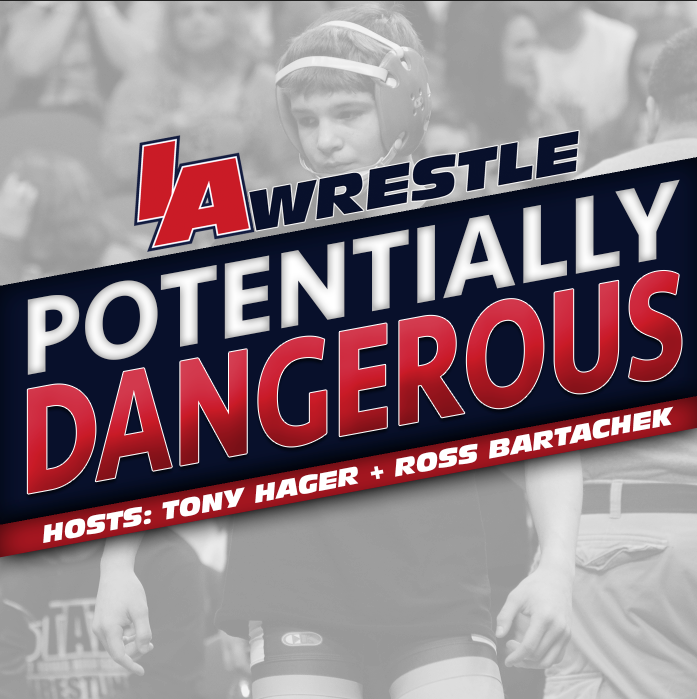 Alex Thomsen (Underwood) 45-0, Jr. over Donny Schmit (Wapsie Valley) 40-7, Jr. (TF-1.5 5:29 (24-9)). 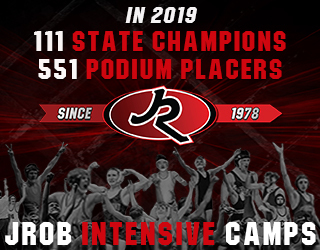 Kody Berg (Westwood) 46-2, Sr. over Ben Moyer (Alburnett) 44-12, Sr. (Dec 7-4). 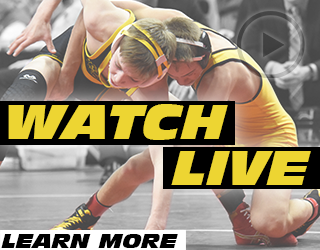 Logan Lutgen (Don Bosco) 42-10, Jr. over Zach Osborne (Mediapolis) 38-15, So. (Fall 3:47). Teagan Lundquist (Southwest Valley) 30-9, So. over Anavin Mounivong (Maple Valley-Anthon-Oto) 38-10, Sr. (Dec 13-10). Chance Throndson (Riceville) 45-1, Jr. over Blake Bauer (Southeast Warren/Melcher Dallas) 46-8, Sr. (MD 12-2). Cooper Siebrecht (Lisbon) 51-9, Jr. over Kolton Roth (Graettinger-Terril/Ruthven-Ayrshire) 43-4, Jr. (Dec 6-4). 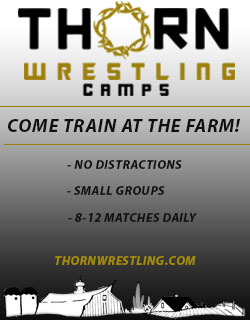 Joshua Tibbits (Martensdale-St. Marys) 39-4, So. over George Appleseth (Panorama) 44-11, Sr. (MD 16-5). Garret Thompson (Logan-Magnolia) 33-5, Jr. over Mason Wickman (Alburnett) 37-15, So. (Fall 3:44). Kaleb Krall (Wapsie Valley) 45-2, So. over Kory Van Oort (West Sioux) 42-6, So. (Dec 1-0). Jacob Hansen (West Fork, Sheffield) 33-3, Sr. over Austin Leopard (Louisa-Muscatine) 44-4, Sr. (MD 12-4). Wade Mitchell (Woodbury Central) 44-14, Fr. over Guy Sudmann (Underwood) 41-18, Sr. (Dec 5-0). Duke Kyle (Missouri Valley) 42-7, So. over Cael Boehmer (Lake Mills) 36-13, So. (MD 12-3). Trent Johnson (Dike-New Hartford) 43-1, Sr. over Dylan Schuck (Sibley-Ocheyedan) 51-1, Sr. (Dec 6-2). Trey Brisker (Wilton) 44-6, Jr. over Braydon Nunemaker (East Buchanan) 42-5, Jr. (Dec 7-4). Austin Eilers (Lawton-Bronson) 36-5, Jr. over Kaleb Boleyn (Columbus Catholic) 42-11, Sr. (Dec 4-1). Chance Downs (Maquoketa Valley) 37-15, Fr. over Logan Scheuermann (AC/GC) 43-8, Sr. (Dec 6-1). Zachary Axmear (English Valleys) 43-0, Sr. over Brennan Swafford (Mediapolis) 48-2, Jr. (Dec 7-4). Drew Anderson (Westwood) 49-3, Sr. over Kaden Kilburg (Lisbon) 46-15, Jr. (Dec 3-1). Skylar Solko (Alta-Aurelia) 43-3, Sr. over Brady Wilson (Logan-Magnolia) 36-7, Sr. (Dec 9-5). Tyler Van Houten (Panorama) 53-5, Sr. over Sawyer Phillips (Pleasantville) 22-5, Sr. (Dec 5-3). John Henrich (Akron-Westfield) 43-0, So. over Jacob Krakow (Iowa Valley) 56-2, Sr. (Dec 4-3). Gabe Pauley (AHSTW) 49-2, So. over Nathan Haynes (Missouri Valley) 58-4, Jr. (Dec 8-6). Dalton Nelson (North Butler) 28-2, Sr. over Griffen McBride (Pleasantville) 42-6, Sr. (SV-1 7-5). Garrett Sayler (Sibley-Ocheyedan) 49-6, Sr. over Luke Peters (South Hamilton) 32-7, Sr. (Dec 6-1). Taylan Entriken (Hudson) 48-1, Sr. over Jarel Arbegast (West Fork, Sheffield) 20-3, Sr. (Dec 8-4). Tanner Sloan (Alburnett) 53-4, Jr. over Trent Kruger (Sibley-Ocheyedan) 49-4, Sr. (Inj. 2:19). Gunnar Grunsted (Panorama) 45-12, Jr. over Bryce Werderman (Lisbon) 48-10, Jr. (SV-1 3-1). Nick Haynes (Missouri Valley) 54-9, Fr. over Dakota Vance (Rockford) 37-9, Sr. (M. For.). Alec McDowell (Maquoketa Valley) 49-2, Sr. over Logan Schumacher (Martensdale-St. Marys) 51-2, Jr. (Dec 6-1). Daniel Bishop (Hinton) 39-1, Sr. over Bryce Oveson (Wilton) 40-5, Sr. (TB-2 4-2). Garet Sims (Iowa Valley) 51-6, So. over Zach Ryg (Central Springs) 41-7, So. (Dec 5-3). Joey Schwenn (Belle Plaine) 43-5, Sr. over Gabe Irons (Lake Mills) 49-8, Jr. (MD 12-4). Slade Sifuentes (Lake Mills) 50-0, Sr. over Hunter Hagen (West Hancock) 42-5, Jr. (TF-1.5 5:17 (16-0)). Walker Even (Don Bosco) 45-5, Sr. over Hunter Dejong (Sibley-Ocheyedan) 48-4, Jr. (UTB 2-1). Mason Lyons (Bellevue) 44-5, Sr. over Tyler Anderson (OA-BCIG) 36-8, Jr. (Fall 5:52). Kaleb Reeves (Sigourney-Keota) 46-7, Jr. over Wes Geisler (Hudson) 46-6, Jr. (Fall 4:26). Drake Johnsen (Logan-Magnolia) 52-3, Sr. over Chaz Clark (Pleasantville) 47-3, Jr. (Fall 2:19). Tom Rief (Missouri Valley) 53-4, Jr. over Noah Boender (Sigourney-Keota) 52-5, Sr. (Dec 9-7). Skyler Bonestroo (Western Christian) 41-5, Sr. over Colton Francis (West Hancock) 37-9, Jr. (Dec 4-3). Caleb Meinders (AGWSR) 34-5, Sr. over Korby Keehner (MFL MarMac) 45-8, So. (Dec 5-2). Jared Brinkman (Regina, Iowa City) 38-1, Sr. over Kyler Schott (North Linn) 50-2, Sr. (Dec 5-2). Brian Sadler (Jesup) 40-2, Jr. over Matt Naig (Sibley-Ocheyedan) 44-4, Sr. (Fall 4:20). Mitchell Smith (Saint Ansgar) 43-8, Sr. over Will Anthony (Pleasantville) 47-6, Sr. (Fall 3:07). Chase Arends (Dike-New Hartford) 34-11, Jr. over Cody Crawford (Waco) 37-11, Jr. (Dec 5-3).